The history of Yuki Suwa Shrine dates back about 1000 years. At that time, the samurai Taira no Masakado led a rebellion against the central government in Kyoto, in a campaign to make himself the “new emperor” of Japan. Masakado occupied this area and was very powerful. Because of this, Emperor Suzaku commanded Shogun Fujiwara Hidesato to defeat him in a battle. Before the battle, Hidesato led the soul of the god Takeminakata to the battle site and enacted a ritual to pray for victory. Using a bow and arrow that was under Takeminakata's power, he shot the arrow toward Masakado's castle. Later, when the fighting began, Hidesato and his samurai defeated Masakado. Giving thanks to the power of Takeminakata, Hidesato offered one of the arrows that he used in battle and built a shrine. This was the beginning of Yuki Suwa Shrine. The shrine was subsequently visited by many samurai seeking victory in battle. Takeminakata is said to be the strongest of the Japanese gods of military arts. Many believe that it was Hidesato’s faith in Takeminakata, the god of victory, that enabled him and his samurai to win the battle. Takeminakata's wife, the goddess Yasakatome, is enshrined together with him. It is said that they had an excellent marital relationship, and that the shrine brings power to marriage. 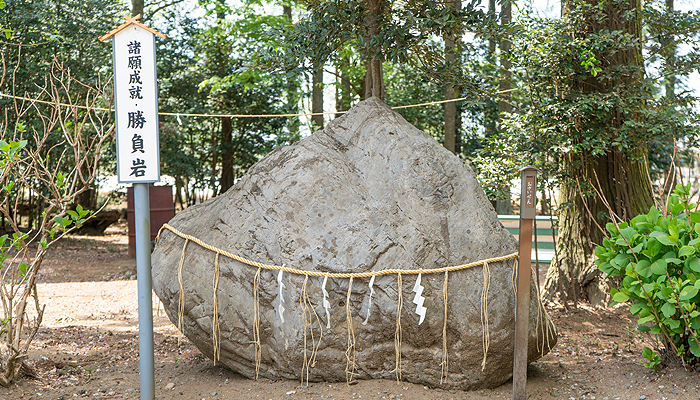 This huge rock is said to have defended Hidesato from the arrows of Masakado. It is said that if you touch it and obtain its force, your wishes will come true. This is the most famous amulet in Yuki Suwa Shrine. The charm is decorated with an arrow and is an object of worship. It contains the power of fight and force for overcoming calamity. It can be worn or carried in a bag. 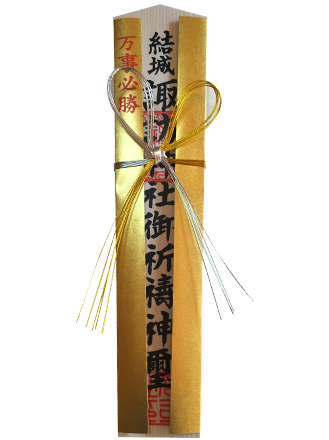 O-fuda is a type of household amulet. It is hung in the house for protection. The amulet brings the power of God to those who are competing – in games, sports or school entrance examinations. 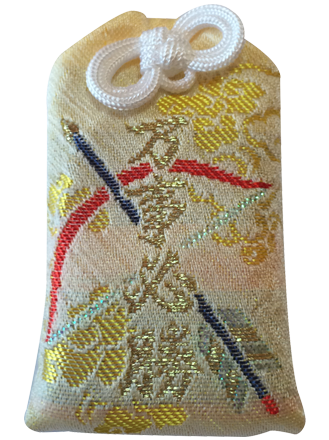 This amulet is only found at Yuki Suwa Shrine in Japan. ※Please note: O-fuda is not a decoration. In Japan, it is placed on the altar of the home, in order to fulfill a wish or desire. Daruma is one of the Buddhist saints. 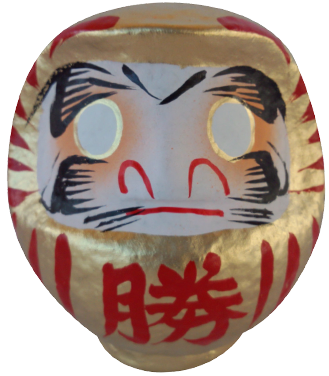 Daruma dolls are talismans of happiness and have been a Japanese tradition since ancient times. The daruma of Yuki Suwa Shrine are painted in gold, the color of victory. You paint the left eye when you make your wish, and paint the right eye when your wish is granted. Yuki City is located in the southwestern part of Ibaraki Prefecture. It is an old historic town, once ruled by the clan of Shogun Yuki. It is famous for a type of silk cloth called Yūki-tsumugi, which is inscribed on the UNESCO list of the Intangible Cultural Heritage of Humanity. Yūki-tsumugi is spun, woven and dyed by hand. It is a luxury fabric, and it is used to make kimonos of the highest quality. Visitors can experience making Yūki-tsumugi in Yuki City. Yuki Suwa Shrine is located in Yuki City, Ibaraki Prefecture. It takes about an hour and a half by train or car from Tokyo. ※Yuki Suwa Shrine offers free parking and admission. Copyright (C) Yuukisuwajinja. All Rights Reserved.